Todd had the day off work for the holiday yesterday, so we decided to go to the zoo. It wasn't raining, but it was freezing cold. 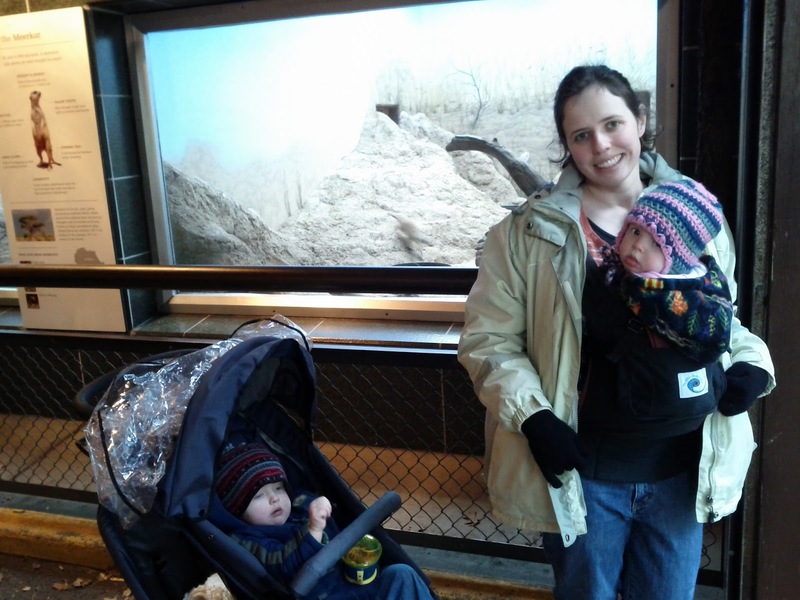 Here I am with the kids and some meerkats. The kids are the ones in beanies, not the ones digging in the sand behind the glass. I promise Jared didn't spend the whole time in the stroller snacking. That was just the circumstance that made him still enough to photograph. 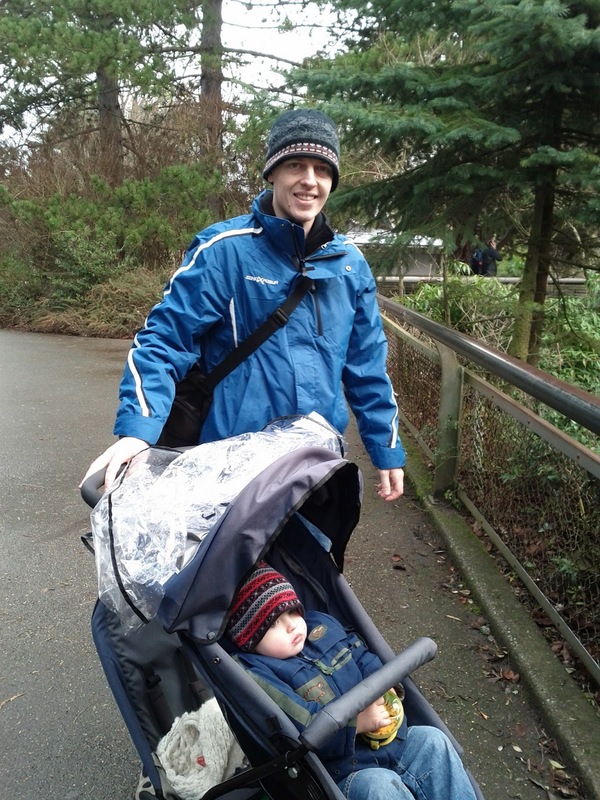 It was great to have a zoo outing with Daddy! I wish we had long weekends more often. This morning, while getting his diaper changed, Jared discovered Eloise's leg warmers. I got them for her because our floors are perpetually freezing, and she spends a lot of time on the floor. 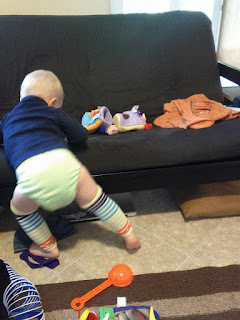 Pants alone just weren't cutting it, and adding tights or leggings made diaper changes a hassle. Jared kept the leg warmers on all day, under his pants. He tells me that his legs were toasty. Jared rocks the turtleneck, diaper, and leg warmers look. No self consciousness here. 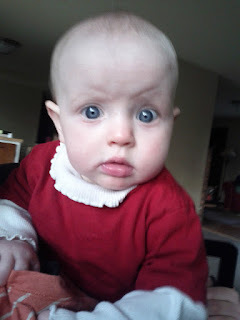 Why does Eloise always stop doing her really cute things and give me the deer-in-the-headlights look when I try to catch her on camera? 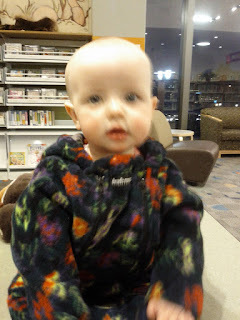 Here she is today. . .
. . . at the library on Wednesday. . .
. . . playing a few days ago. . .
. . . on Christmas day. . .
Of course, if there is one thing I have learned from parenting, it is that children never ever follow their own patterns all of the time. Eloise is my favorite 2011 adventure. Happy New Year! May your 2012 be as happy and full of adventure as our 2011. We Wish You a Merry Christmas Day! After a month of buildup for Christmas, the week leading up to Christmas this year was a little bit disappointing. Jared caught a virus that was not your run of the mill cold. 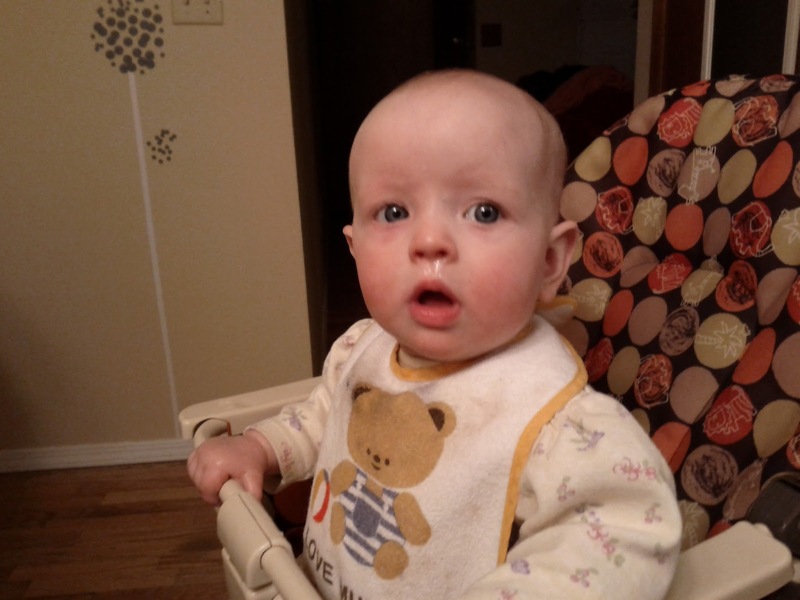 He was coughing all weekend the week before Christmas, and on Monday and Tuesday he got worse instead of better. We took him to see the doctor, who declared Jared to be on the mend. 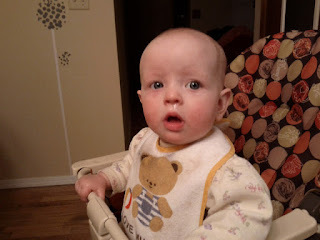 That afternoon he deteriorated into a sad little mess with a high fever. 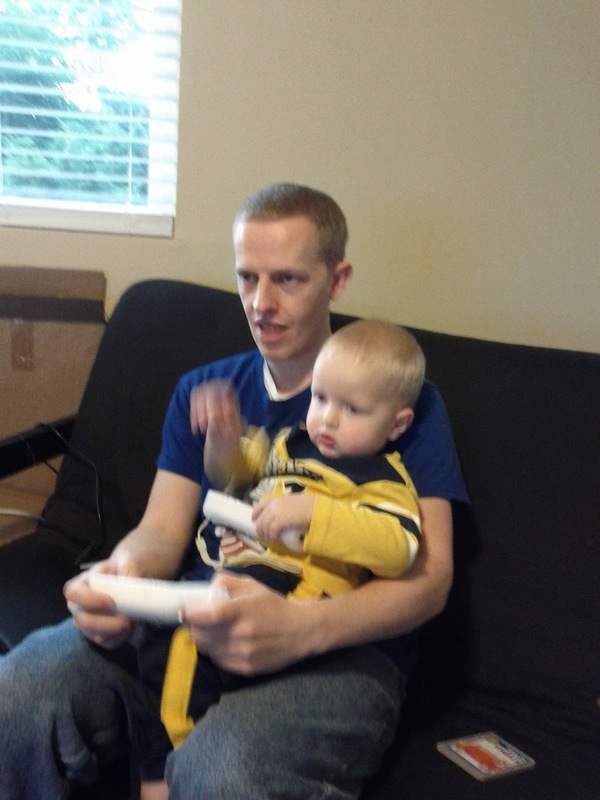 When Todd got home from work, he gave Jared a blessing and then sent us to urgent care. 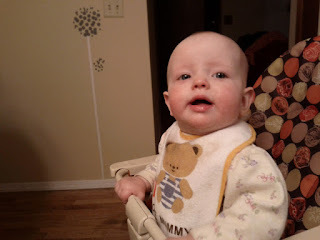 We spent the night going back and forth between medications to get the fever to come down and stay down. I thought that nothing on earth could be more sad than a feverish little Jared refusing to leave the couch, but I was wrong. Soon Eloise caught the same bug, but it was stronger in her tiny little body. She refused to eat for several days, and had coughing fits that made her throw up several times. She also had a high fever, but we didn't want to give her ibuprofen on her already upset stomach, so we were stuck with just tylenol. We had two separate trips to the doctor for her, too. She has finally just started eating again. As you might imagine, we didn't sleep very much last week. We are just now beginning to emerge from our sleepless haze. To the best of my fuzzy recollection, we did have Christmas this weekend. We spent Christmas Eve baking cookies for Santa, delivering the extra cookies to our neighbors, and playing in the yard. We also read the Christmas story out of the New Testament story book, put our star on top of the Christmas tree, and watched some videos about the birth of Jesus Christ, available here. 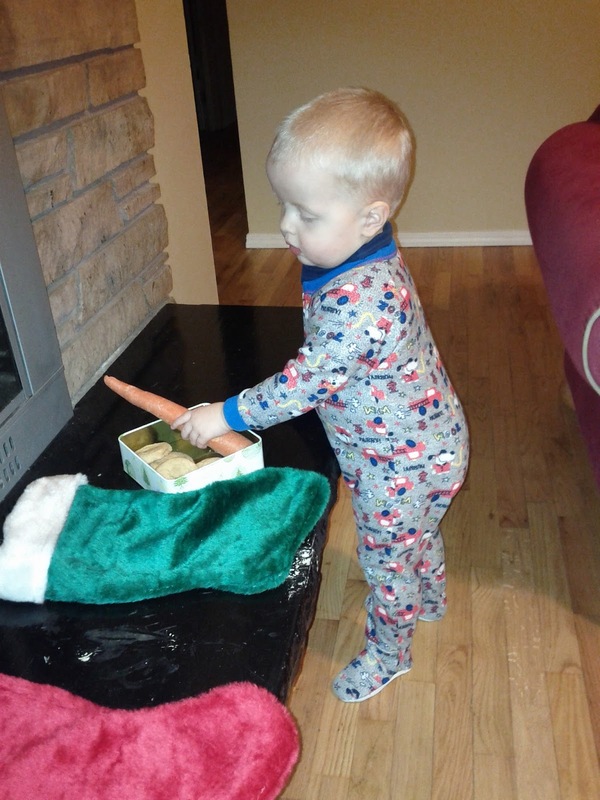 Later, Jared was excited to set out some snickerdoodles for Santa, along with one carrot for the reindeer to fight over. I'm not sure he ever understood just what Santa was coming for. After we tucked him into bed, we had to reassure him several times that Santa would not be coming into his room after he fell asleep. When Christmas morning finally arrived, a very excited mom and dad had to direct Jared to his stocking. He was finally convinced to look inside it, and then refused to proceed with the morning's festivities until he got to eat his orange from Santa. This helmet is not new. We got it out for the tricycle, which is new. The helmet was a lot more interesting, though. Eloise wasn't really ready to be up when we took her out to open presents. She didn't last very long before she started crying to go back to bed. Here is a sampling of our Christmas morning experience, for our family that had to suffer through Christmas without us this year. 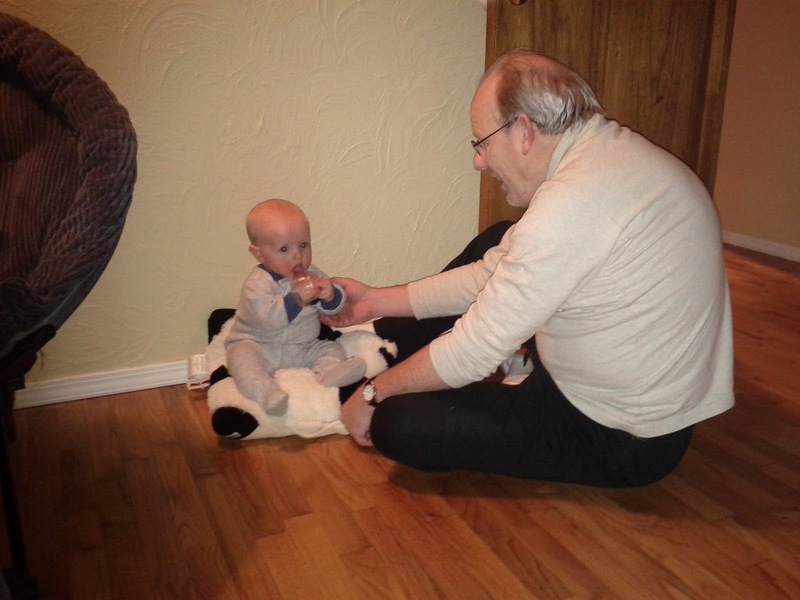 And here are some pictures of our Christmas afternoon, after church. 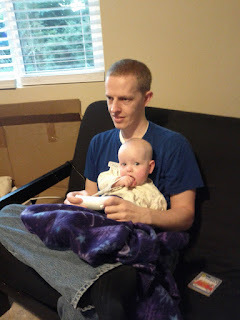 Jared and Eloise gave Daddy a new game for the wii, and they spent the afternoon playing it together. You'll notice, in the pictures above. that although Todd does not move, the child in his lap changes. That was Todd's version of keeping the kids out from under my feet while I prepared our Christmas feast. 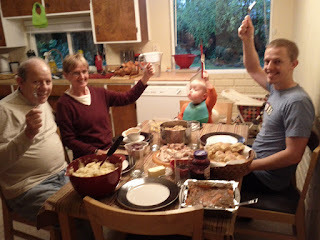 We had ham, rolls (Grandma Jolley's recipe, but never quite as good as Grandma Jolley made), au gratin potatoes, salad, and a chocolate pie, which I made from scratch. I should have waited to make the pie until after I opened my Christmas present from my family: a kitchenaid countertop mixer. I am not exaggerating when I say that making a fluffy meringue with nothing more than a whisk and elbow grease takes no less than 45 minutes. When we put the table cloth on the table, Jared said, "It's Thanksgiving!" 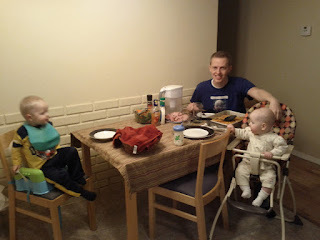 You can tell we are really classy eaters, since that is the only other time he remembers eating off a table cloth. The confusion continued for several days as we ate leftover ham, and Jared kept asking for, "More gurkey, please." Eloise, still not eating at this point, loved to watch us eat. For all of our complaining about her not sleeping through the night, she is an extremely content child during our waking hours. If she is left out of something, she will just drag herself over to where the action is and try to climb our legs until we put her at eye level with the fun. It was great to have this day to enjoy our little family and remember the birth of Jesus Christ. As much as we missed the extended family this year, we are really glad we weren't traveling with the kids sick. We have also been really busy with the paperwork and negotiations for buying a house, so we were glad not to have to work around a trip right now. Over the next few days, we got to enjoy all of the great gifts that came from family and friends. These balls were a winner, Grandma and Grandpa Knight. Eloise hardly plays with anything that isn't a ball or on wheels. We used this apostle matching game from Aunt Colette for family home evening. I think Jared never actually stopped playing it. He keeps bringing me balloons with the pictures of the apostles on them and asking, "Who's that?" He's keeping me on my toes with remembering all of their names. Thanks for thinking of us, family, even though you are all far away. Merry Christmas! We will see all of you soon. 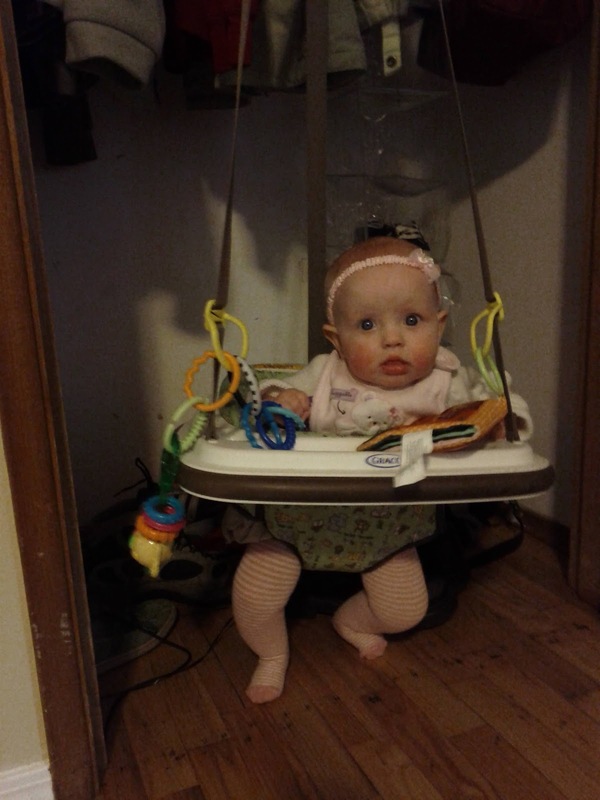 Eloise is 8 months old today. She didn't get a lot of mention in the Christmas post because she is too busy being a baby to notice much Christmas festivity. Eloise is an independent little woman. 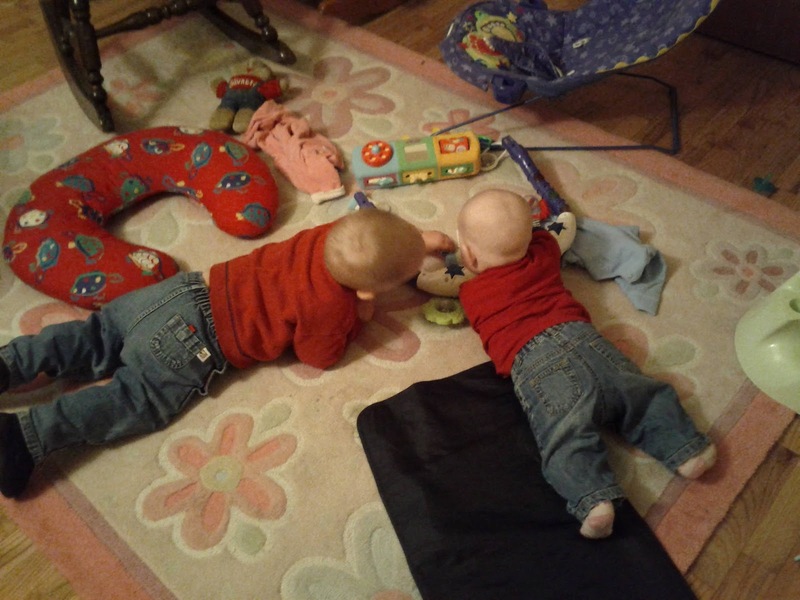 She loves to crawl around on her belly to open doors, chase toy cars, eat stray pieces of paper that fall within her reach, and find Jared to see what he is doing and whether she can join in. 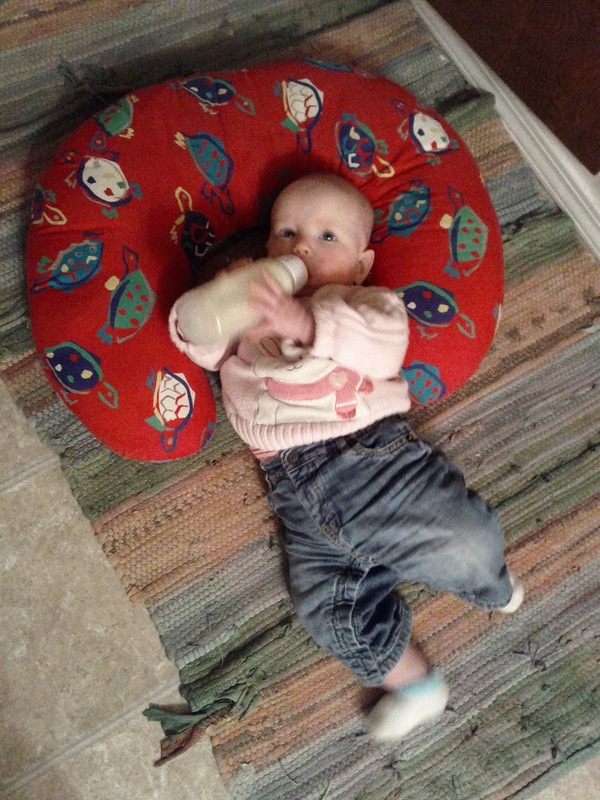 She had a brief stint (about a month) where she would feed herself a bottle if we propped her on a pillow with it. 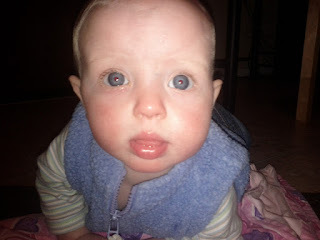 Now that her crawl is getting more efficient, though, she doesn't sit still long enough to drink more than a few swallows before she is off to investigate a sound or a toy or a cupboard door that she can see. If we want her to eat we have to tuck her securely into our arms and take her away from any stimulation (translation: Jared). The princess was a reluctant sitter, since sitting up meant sitting still, and not being able to crawl around at will. 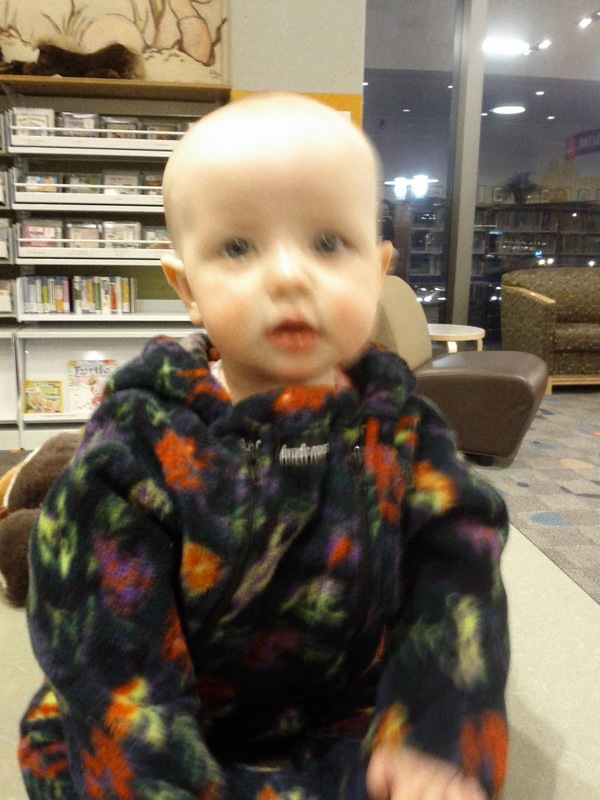 She finally stayed sitting up unsupported on November 30, when I set her in a sitting position at library story time. Here is the big moment, captured on camera. Eloise has always sort of had her own thing going on. Whenever anyone would try to play with her, she would stop what she was doing to watch the other person instead of interacting. That changed yesterday, when Eloise learned how to clap. Now she will clap when we ask her to, some of the time. If her socks are off she claps her feet instead of her hands, since they make a louder clap. She learned how to blow raspberries when she was experimenting with the B sound. It didn't take very long for "B-b-b-b-b" to turn into spitting. Now she spits all of the time. I blame the influence of two eight month old spitters who we frequently sit near at church. 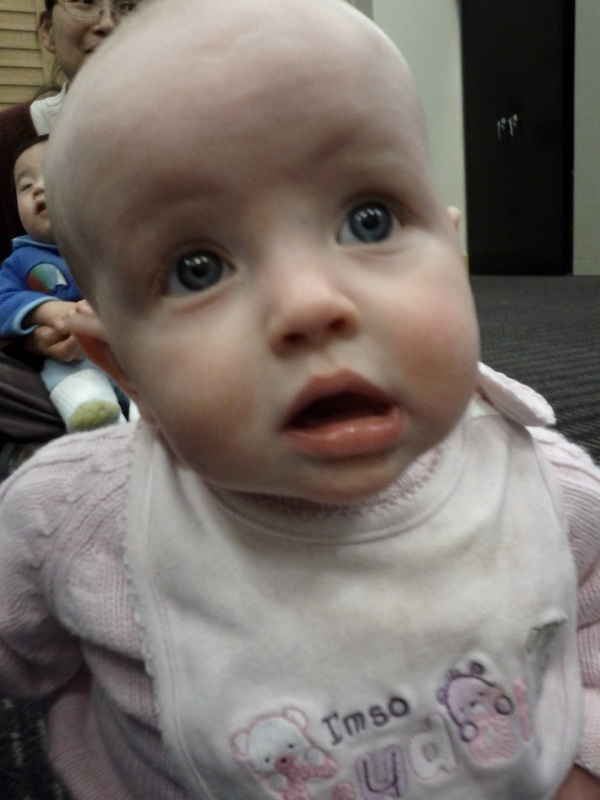 Eloise's transformation into an interactive baby has not been limited to clapping. 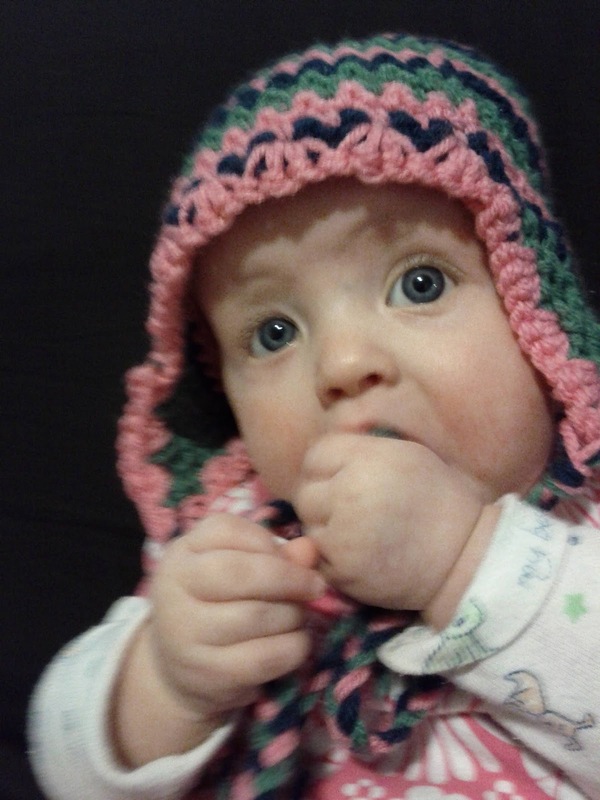 She also grabs my hands to play pat-a-cake, and continues gurgling and spitting when I talk back to her. This is the best age. Isn't she a doll? Eloise has been a terrible sleeper for several months. She has been waking up multiple times at night totally unpredictably. We finally figured out that she has been getting cold at night, so we started putting her in two sets of pajamas, and putting a heating pad in her crib before we put her down in it, and she is down to two wakings per night. 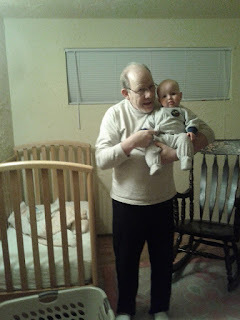 It sounds bad, but they are fairly predictable now, which helps us get a lot more sleep. Obviously we are not so great at this cold weather business. All of the jacket layering and keeping track of mittens and gloves and hats was getting to be a bit much for getting out the door, until I got around to getting Jared a thick winter coat, and I discovered buntings. 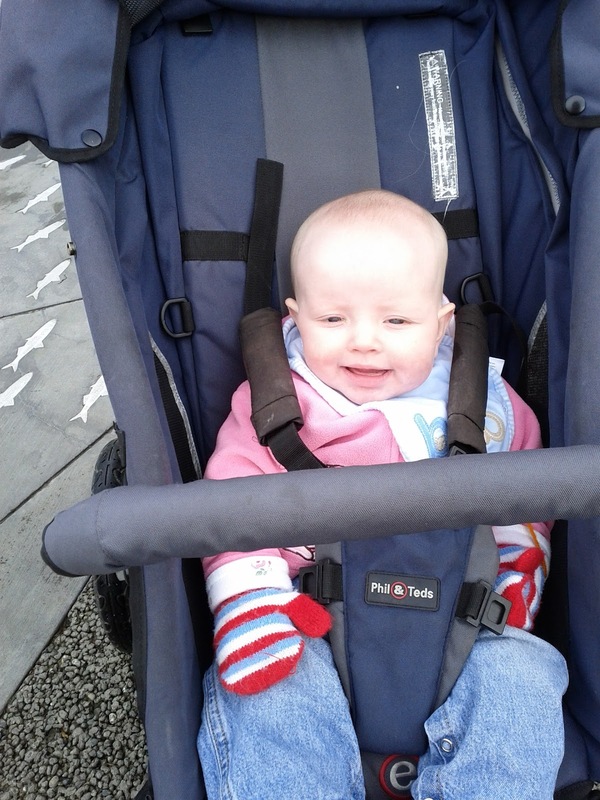 Having one clothing item that keeps the baby warm from head to toe is brilliant. 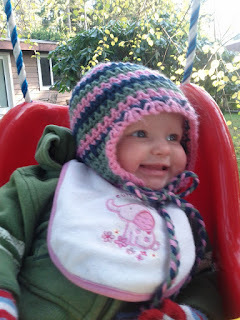 Here is the princess, snug and warm, even though I had to break ice out of the swing before she got into it. This sweet baby still doesn't have any teeth, and her progress in solid foods is slow. It is made even slower by her new need to either hold the spoon herself or blow raspberries with food in her mouth. Baby feeding is a messy business. All in all, we are all glad to have this ticklish little thing around. 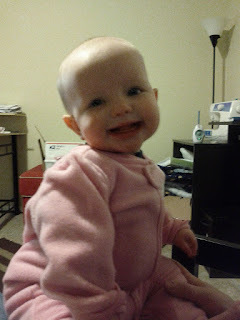 She laughs at Jared's antics and chews away at our fingers, and keeps us on our toes with her curiosity. Don't grow too fast, little princess. Jared is really excited about Christmas. We got a tree and put it up before Grandpa left, and since then Jared has been bubbling with Christmas excitement. 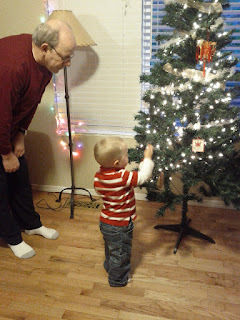 He reminds us several times a day, "We're having Christmas!" Jared sings Christmas carols all the time. His favorites are "Rudolph the Red Nosed Reindeer" and "We Wish You a Merry Christmas." Every time we see Christmas lights or decorations, Jared points them out. When he saw the holiday section at the grocery store, he said, "The grocery store is having Christmas, too!" It is really fun to see Jared discovering holiday excitement for the first time. His enthusiasm is contagious. We had a family home evening activity braving the cold and ice outside to walk around our neighborhood looking at Christmas lights. Now, every evening, when Jared realizes that it is getting dark outside, he reminds us to turn on the lights on our Christmas tree. 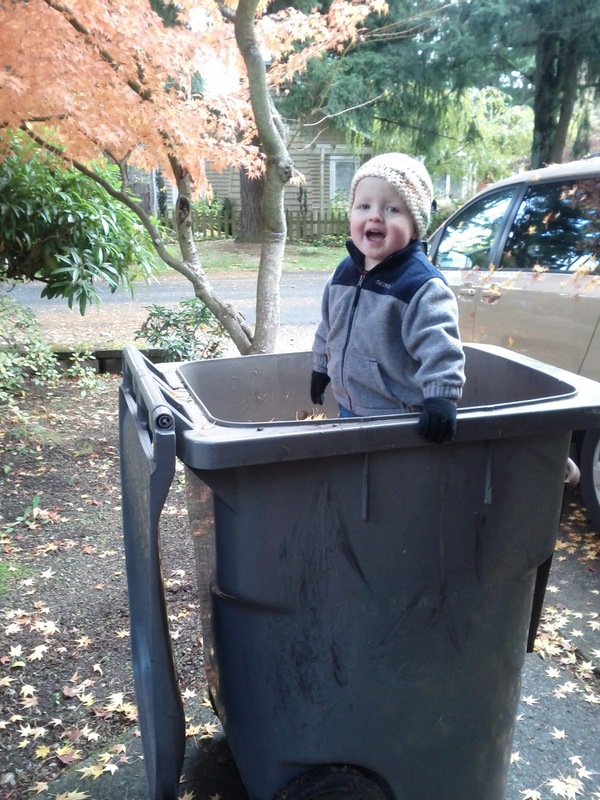 I've also found him more than once pulling his shoes out of the closet and hanging onto the front door handle, ready to go see Christmas lights. One thing that Jared has a really hard time getting excited about is Santa Clause. You might remember our sad little episode trying to get him on Santa's lap last year. This year was no different. Santa made an appearance at our church Christmas party. I had Jared persuaded to go tell Santa "Merry Christmas," but the line was really long, and bedtime was very near. By the time our turn came, I was praying that the jolly old elf would have the sensitivity not to "Ho ho ho!" at this over stimulated, exhausted two year old with a Santa phobia. Santa was a true professional and took Jared's aversion to him in stride. Eloise was game for sitting on the bearded fellow's lap, as long as she got a fistful of whiskers. Later, when we explained to Jared that Santa comes down the chimney into our house and leaves presents in the Christmas stockings, Jared got agitated and had to be reassured that Santa isn't coming into our house today, and he won't come if Jared doesn't want him to. When you think about it, Santa's house breaking is fairly unacceptable. I think this family is about ready to let the Santa tradition peter out. One advantage of an aversion to Santa Clause is that Jared has a really good grasp on the true meaning of Christmas. Yesterday we were driving to look at a house for sale and Jared piped up from the back seat,"It's Christmas time! Jesus was born!" Another time, Jared and I were in the kitchen making dinner together while Eloise played on the floor. It got quiet for a minute, so Jared broke the silence with a sweet, "Merry Christmas, Mommy." Could he possibly be more adorable? One day, we got ambitious and did a holiday craft. 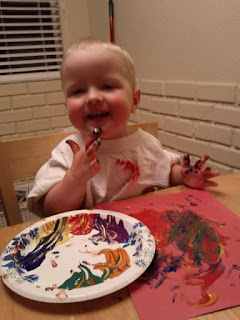 This was Jared's first painting project since he stopped eating paint. He loved it. 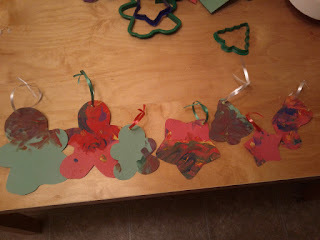 After his two paintings were dry, we pulled out the Christmas cookie cutters, and Jared told me where to trace them. I cut them out, then used my eyelet setter for the first time since assembling our wedding invitations to put an eyelet in each shape. We added ribbon, and now we have ornaments! 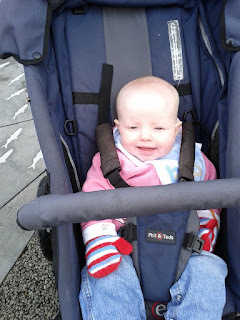 One day last week we went to the mall to play out of the cold. The mall has been transformed with Christmas decorations. There is a decorated Christmas tree about every twenty yards on the mall floor, which had Jared in a flurry of excitement. When we reached the play area, excitement turned to awe as Jared found himself at eye level with nine flying reindeer near the mall ceiling, complete with bobbing heads and a blinking-nosed Rudolph in the lead. "It's Rudolph! Rudolph!" There was not a lot of playing after this discovery. We have been doing a lot of baking to keep our house warm and smelling like Christmas. Jared is a master baker. This Monday we made sugar cookies for our playgroup, which came to our house on Tuesday morning for cookie decorating. Jared looks at home with his rolling pin and apron. We had ten children in the house, including three babies, for some delightful, sticky, holiday mayhem. 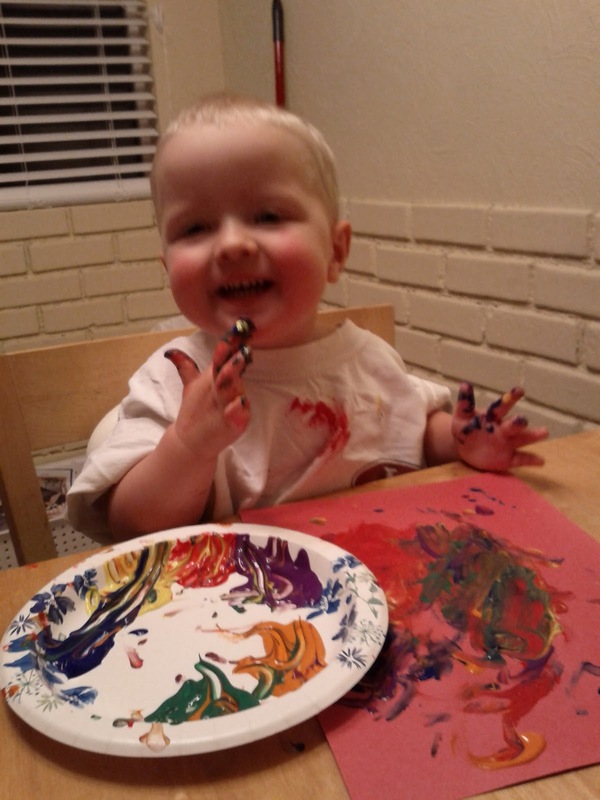 As the other toddlers dumped sprinkles and candy all over their plates, Jared picked up a sprinkles bottle, angled it downward, and gently tapped the bottom of the bottle so that the sprinkles would come out slowly and only on his cookie. This little man has his techniques in the kitchen. As I baked a batch of pumpkin chocolate chip cookies this evening to take visiting teaching tomorrow, Todd pointed out that there has only been one day this week that we haven't baked or decorated cookies. I bet you all wish you were here. We're having Christmas! Merry Christmas everybody! This year, we are thankful for grandparents. Where has the time gone? House hunting, Christmas preparations, and the daily grind have stolen the time away. With Christmas itself around the corner, I had better get caught up on some of our exciting adventures. Grandma and Grandpa Knight came to our house for Thanksgiving this year. They probably regretted it, since it was raining and freezing cold the whole time they were here, but we were very happy to have them. Grandpa Knight came to town the Saturday before Thanksgiving. He told Grandma before he came that he was going to spend his whole week here playing with Jared, but Eloise must have been enchanting because they were attached at the hip for a lot of his visit. 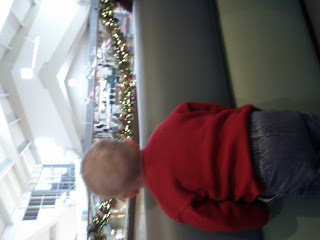 Here they are watching the children play at the Bellevue Square Mall "inside playground," as Jared calls it. Of course Jared and Grandpa had a lot of fun together. Grandpa remembers everything that Jared likes and does his very best to spoil him. He brought Jared a watch and a fan because he knows that Jared loves them (and associates all wristwatches and fans with Grandpa). 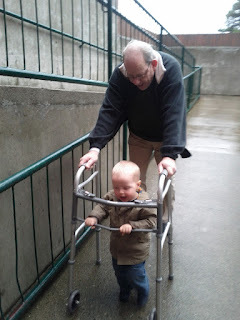 Jared was also excited that Grandpa brought his jungle gym/walker for Jared to play with. This arrangement might decrease the efficacy of the walker, but it certainly gets a lot of adoration from passing pedestrians. Grandma had to work for part of Thanksgiving week, so she flew in on Wednesday and went home to Arizona on Sunday. She had to make the most of her limited time here by making a big mess in Jared's room with him. She reintroduced Jared to these previously very neglected blocks. 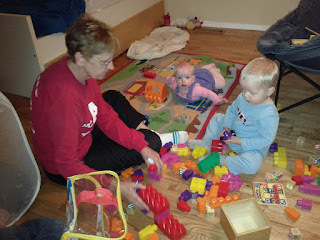 Since Grandma's visit, Jared has had these blocks out almost every day. He has even started to build his own towers, instead of just knocking them down. Meanwhile, Grandpa and Eloise bonded over their shared baldness and limited mobility. 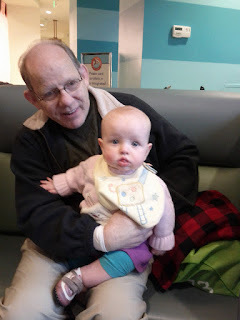 I took a lot of pictures of Grandpa and Eloise. They are just so sweet together that I couldn't resist. Thanksgiving dinner itself was a great success, thanks to Grandma's expertise. I am still at a total loss over how gravy thickens. Theoretically I get it, but my only gravy success ever was a total accident. Somehow it thickened to the right consistency just as I was getting ready to throw it away. It's a good thing we had Grandma here to do it for us this year. Here is a picture of our spread, and some very hungry Knights waiting for me to stop taking pictures and let them eat, already. If you look closely at the picture above, you can see that Todd grew out his facial hair for the whole month of November. You might need a magnifying glass. 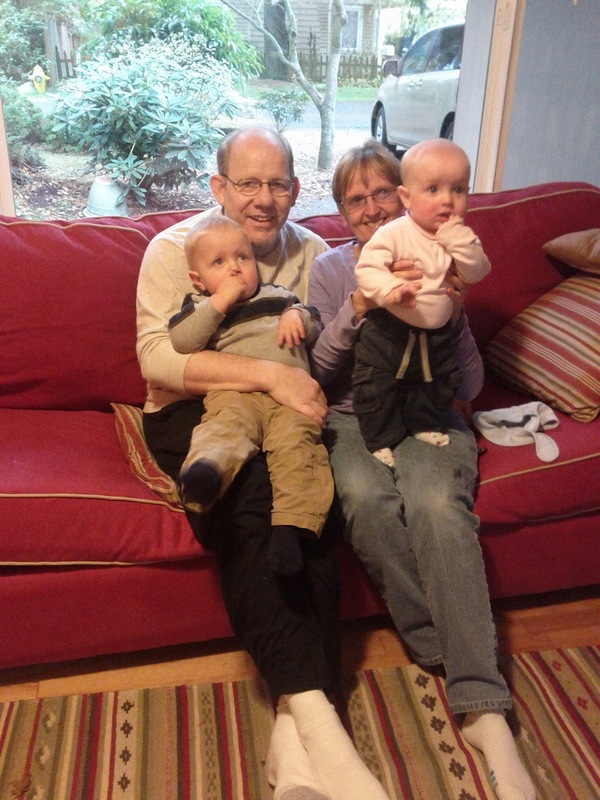 On Saturday we let Grandma and Grandpa babysit so we could go see the new Muppet movie. I like that they have persuaded me that it was us doing them a favor instead of them doing one for us. It was really nice to have a date with my handsome and talented husband. 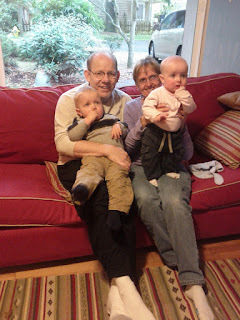 Our uncooperative-for-pictures children sat for a few pictures with Grandma and Grandpa, just as non compliant as ever. Get those fingers out of your mouths and look at the CAMERA, kids! They are keeping it real, as usual. This Thanksgiving I am thankful to have married into the best family that anyone could ever ask for. In addition to an amazing husband I got fantastic in-laws. Thank you for suffering through the shocking cold to come visit! One year ago last week, Grandma Knight was run over by a truck. We are really thankful she was still around, walking, and healthy again to celebrate Thanksgiving with us. She even ran a 10K last Saturday to celebrate her mobility! Hurrah for Grandma! Even though it has been chilly and rainy all November, we haven't been completely shut in. 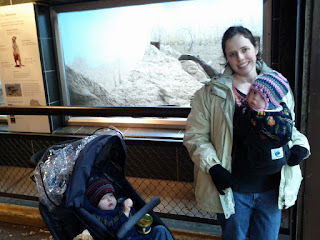 Jared, Eloise, and I had a trip to the zoo on one rainy day. I was terrible about taking pictures. This is about it. We spent a lot of time raking our leaves, that fell until they were knee deep in our yard and driveway. We took advantage of our few dry days to play in the yard. Of course the leaves kept falling faster than we could rake them up. We have a whole system for raking leaves, now. Eloise rides in the baby carrier on my back, and Jared. . .
. . . can't get enough of those leaves anywhere! After freezing in the yard, we needed something to warm us up. 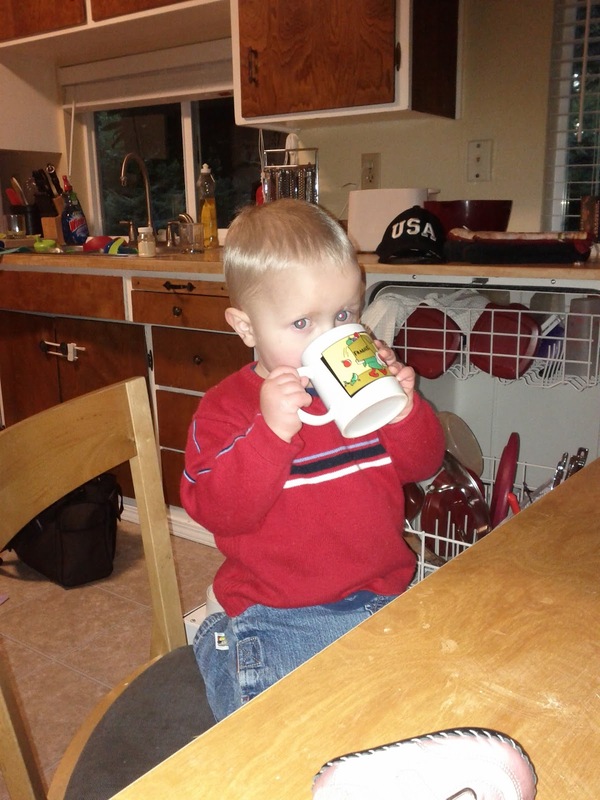 Jared had his first cup of apple cider. He wouldn't stop drinking for the picture. Eloise isn't as avid a jumper as Jared, but she does enjoy an occasional jump. There is no chance of getting a picture of her smiling in the jumper, though, because she only smiles when she is whizzing up and down. One day, as a family home evening activity, we made pizzas. Jared is quite the chef. 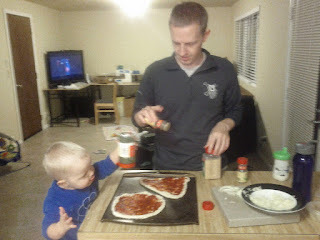 He made some really spicy pizzas. 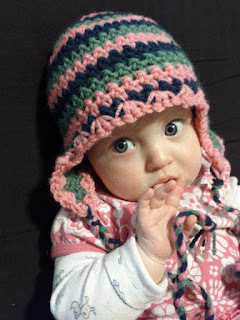 Aunt Cheyenne made Eloise a new hat, so we had a little photo shoot for her etsy shop. This photo was the favorite. Our little princess is very photogenic. 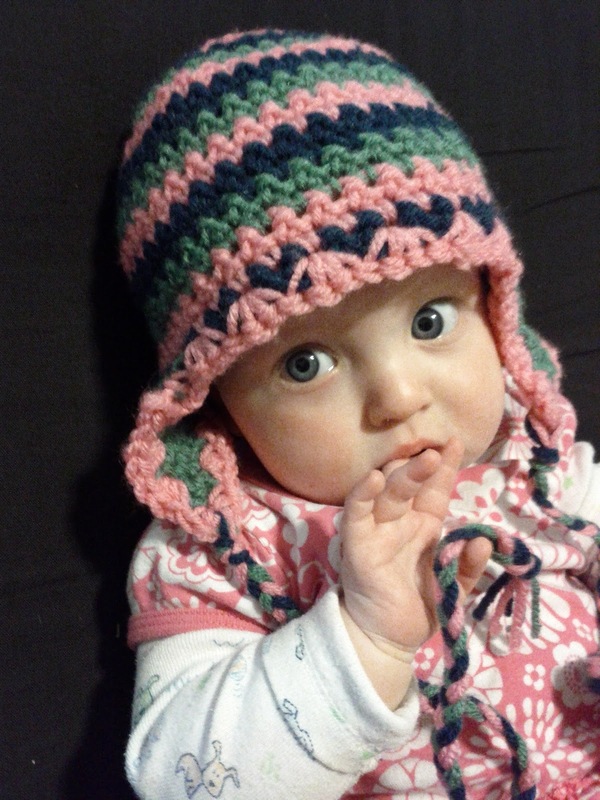 Thanks for the hat, Aunt Cheyenne! It's delicious. 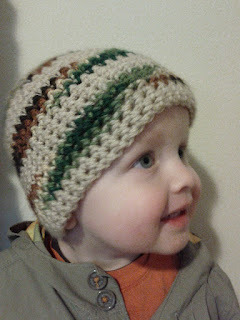 Jared also modeled a hat that Cheyenne made for him a last summer. 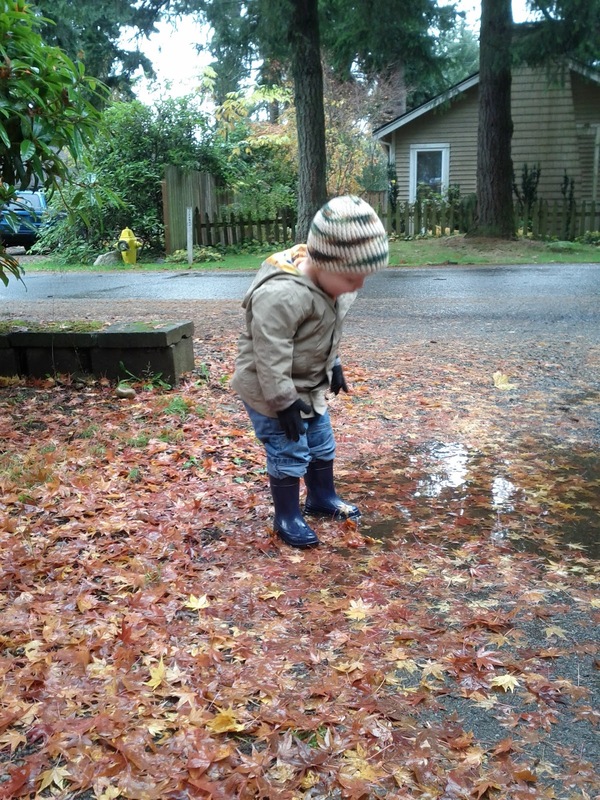 We couldn't put on hats without going outside to splash in puddles. I'm trying to persuade Jared that splashing in puddles is for boots only, not gloves. In spite of all of our raking, this is roughly what our driveway looks like right now. We are waiting for a couple of dry days so that we can rake them up again. Correction: We are waiting for two consecutive dry days corresponding with me being motivated. I have been surprised how much work it is to get the kids bundled up to go outside. The boots, coats, mittens, extra socks, and hats can be a lot to deal with just to get out the door, not to mention keeping track of it all at the park/zoo/library/store. I need to find a way to streamline the process so we can get out of the door in less than half an hour. Any suggestions? I love this beautiful cold rainy weather. I probably just need to be more organized.